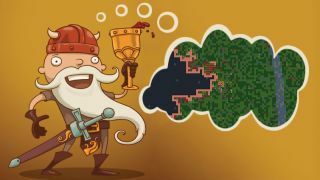 In early July 2014, Dwarf Fortress received its first major update in two years. We wrote about why now is the time to get into the game with our guide Into the deep . Reading about the new features in Dwarf Fortress 2014 ended up giving me the bug: I'm determined to learn how to run a fortress and how to navigate Dwarf Fortress' labyrinthine menus. But I'm not embarking alone. I pulled in PC Gamer video producer (and DF veteran) Will Chesney to teach me the ways of Dwarf Fortress' bloody world. This is episode one of our Dwarf Fortress Let's Play. It's aimed at newcomers like me who want to learn the game. As we play, we'll talk through the complex process of beginning a fortress, controlling our dwarves, and learning new mechanics. It may all end in blood and tragedy, but at least we'll learn something along the way. Look for new episodes of our series every Tuesday and Thursday. Now: let's strike the Earth!